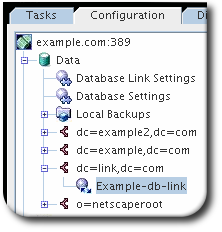 The database link can be configured to point to another database link, creating a cascading chaining operation. A cascading chain occurs any time more than one hop is required to access all of the data in a directory tree. Cascading chaining occurs when more than one hop is required for the directory to process a client application's request. The client application sends a modify request to Server 1. 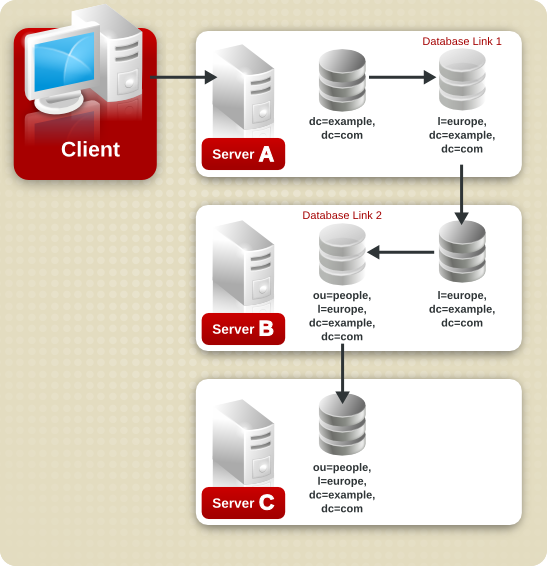 Server one contains a database link that forwards the operation to Server 2, which contains another database link. The database link on Server 2 forwards the operations to server three, which contains the data the clients wants to modify in a database. Two hops are required to access the piece of data the client want to modify. During a normal operation request, a client binds to the server, and then any ACIs applying to that client are evaluated. With cascading chaining, the client bind request is evaluated on Server 1, but the ACIs applying to the client are evaluated only after the request has been chained to the destination server, in the above example Server 2. The root suffix dc=example,dc=comand the ou=people and ou=groups sub suffixes are stored on Server A. The l=europe,dc=example,dc=com and ou=groups suffixes are stored in on Server B, and the ou=people branch of the l=europe,dc=example,dc=com suffix is stored on Server C.
First, the client binds to Server A and chains to Server B using Database Link 1. 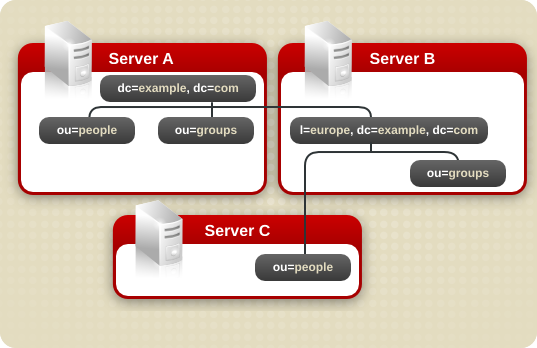 Then Server B chains to the target database on Server C using Database Link 2 to access the data in the ou=people,l=europe,dc=example,dc=com branch. Because at least two hops are required for the directory to service the client request, this is considered a cascading chain. Select the Configuration tab. Expand the Data folder in the left pane, and select the suffix, then the database link. Select the Check local ACI check box to enable the evaluation of local ACIs on the intermediate database links involved in the cascading chain. Selecting this check box may require adding the appropriate local ACIs to the database link. Enter the maximum number of times a database link can point to another database link in the Maximum hops field. By default, the maximum is ten hops. After ten hops, a loop is detected by the server, and an error is returned to the client application. Point one database link to the URL of the server containing the intermediate database link. Configure the intermediate database link or links (in the example, Server 2) to transmit the Proxy Authorization Control. The OID value represents the Proxy Authorization Control. For more information about chaining LDAP controls, see Section 2.3.2.2, “Chaining LDAP Controls”. Create a proxy administrative user ACI on all intermediate database links. The ACI must exist on the server that contains the intermediate database link that checks the rights of the first database link before translating the request to another server. For example, if Server 2 does not check the credentials of Server 1, then anyone could bind as anonymous and pass a proxy authorization control allowing them more administrative privileges than appropriate. The proxy ACI prevents this security breach. Create a database, if one does not already exist, on the server containing the intermediate database link. This database will contain the admin user entry and the ACI. For information about creating a database, see Section 2.2.1, “Creating Databases”. Create an entry that corresponds to the administrative user in the database. This ACI is like the ACI created on the remote server when configuring simple chaining. Carefully examine access controls when enabling chaining to avoid giving access to restricted areas of the directory. For example, if a default proxy ACI is created on a branch, the users that connect through the database link will be able to see all entries below the branch. There may be cases when not all of the subtrees should be viewed by a user. To avoid a security hole, create an additional ACI to restrict access to the subtree. Enable local ACI evaluation on all intermediate database links. Setting this attribute to on in the cn=default instance config,cn=chaining database,cn=plugins,cn=config entry means that all new database link instances will have the nsCheckLocalACI attribute set to on in their cn=database_link, cn=chaining database,cn=plugins,cn=config entry. Create client ACIs on all intermediate database links and the final destination database. Because local ACI evaluation is enabled, the appropriate client application ACIs must be created on all intermediate database links, as well as the final destination database. To do this on the intermediate database links, first create a database that contains a suffix that represents a root suffix of the final destination suffix. For example, if a client request made to the c=africa,ou=people,dc=example,dc=com suffix is chained to a remote server, all intermediate database links need to contain a database associated with the dc=example,dc=com suffix. This ACI allows client applications that have a uid in the cn=config entry of Server 1 to perform any type of operation on the data below the ou=people,dc=example,dc=com suffix on server three. An LDAP control included with Directory Server prevents loops. When first attempting to chain, the server sets this control to be the maximum number of hops, or chaining connections, allowed. Each subsequent server decrements the count. If a server receives a count of 0, it determines that a loop has been detected and notifies the client application. The number of hops allowed is defined using the nsHopLimit attribute. If not specified, the default value is 10. If the control is not present in the configuration file of each database link, loop detection will not be implemented. URL of the server containing the next database link in the cascading chain. To create a cascading chain involving three servers as in the diagram below, the chaining components must be configured on all three servers. The first section creates the entry associated with DBLink1. The second section creates a new suffix, allowing the server to direct requests made to the database link to the correct server. The nsCheckLocalACI attribute does not need to be configured to check local ACIs, as this is only required on the database link, DBLink2, on Server 2. To implement loop detection, to specify the OID of the loop detection control in the nsTransmittedControl attribute stored in cn=config,cn=chaining database,cn=plugins,cn=config entry on Server 1. As the nsTransmittedControl attribute is usually configured by default with the loop detection control OID 1.3.6.1.4.1.1466.29539.12 value, it is wise to check beforehand whether it already exists. If it does exist, this step is not necessary. Do not use the Directory Manager or Administrator ID user as the proxy administrative user on the remote server. This creates a security hole. Since database link DBLink2 is the intermediate database link in the cascading chaining configuration, set the nsCheckLocalACI attribute to on to allow the server to check whether it should allow the client and proxy administrative user access to the database link. nsTransmittedControl: 2.16.840.1.113730.3.4.12 is the OID for the proxy authorization control. nsTransmittedControl: 1.3.6.1.4.1.1466.29539.12 is the or the loop detection control. Check beforehand whether the loop detection control is already configured, and adapt the above command accordingly. Add a local client ACI so the client operation succeeds on Server 2, and it can be forwarded to server three. This local ACI is needed because local ACI checking is turned on for the DBLink2 database link. Both ACIs will be placed on the database that contains the c=africa,ou=people,dc=example,dc=com suffix. To create these ACIs, the database corresponding to the c=africa,ou=people,dc=example,dc=com suffix must already exist to hold the entry. This database needs to be associated with a suffix above the suffix specified in the nsslapd-suffix attribute of each database link. That is, the suffix on the final destination server should be a sub suffix of the suffix specified on the intermediate server. This ACI allows clients that have a UID in c=us,ou=people,dc=example,dc=com on Server 1 to perform any type of operation on the l=Zanzibar,c=africa,ou=people,dc=example,dc=com suffix tree on server three. If there are users on Server 2 under a different suffix that will require additional rights on server three, it may be necessary to add additional client ACIs on Server 2. This ACI gives the Server 2 proxy admin read-only access to the data contained on the remote server, server three, within the l=Zanzibar,ou=people,dc=example,dc=com subtree only. The cascading chaining configuration is now set up. 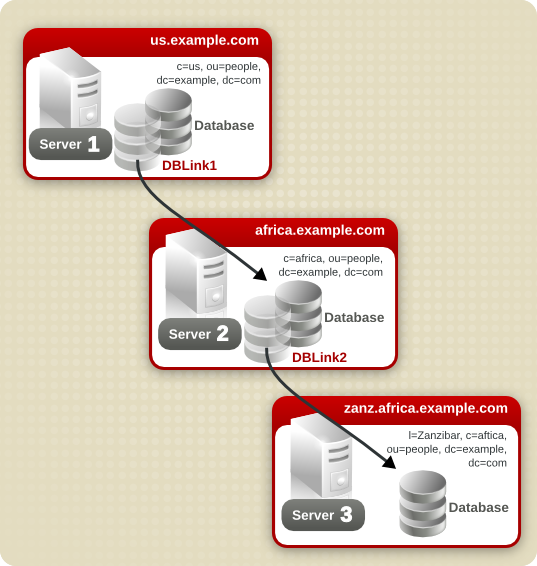 This cascading configuration allows a user to bind to Server 1 and modify information in the l=Zanzibar,c=africa,ou=people,dc=example,dc=com branch on server three. Depending on your security needs, it may be necessary to provide more detailed access control.